Today is Taayoush’s last day on this side of the planet. 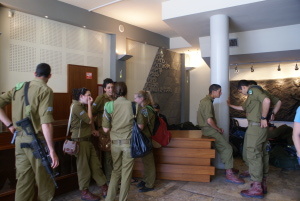 We left the Youth Hostel after breakfast : we are now going to visit the Haganah museum, a « must » according to Tanguy. The Haganah, he told us, is a Jewish militia that fought against the British occupation before the independence of Israeli. It then gave birth to Tsahal, the Israeli army. We have got to go through part of the city centre of Tel Aviv before gettingto the museum. We cross Carmel Market. The atmosphere in the covered passage is typically oriental. The buyers make their way between the rows of vegetable, spice, clothes, kitchenware and jewels stalls in an indescribable hubbub. It looks and sounds just like an Arabic souk and could easily be mistaken for one, except that everything here is written in Hebrew. When we leave the market, we take streets whose buildings are in the purest Bauhaus style, « an architecture that is close to modernism and that puts the emphasis on egalitarianism », our Lonely Planet guide read. “It is characterized by a high sobriety that is symbolized by the dazzingly white colour of the buildings. Tel Aviv was nicknamed « The white city » in the 30s and 40s. The UNESCO has listed this part of the city among the world heritage sites.” As for us, we think that the name « the grey city » would fit better : despite the ongoing repairing work on a number of buildings, this part of the town looks grey and dilapidated. There is an obvious lack of means to launch a vast programme of restoration. Israel is not poor though. We can’t help thinking that it is a real pity (to say the least) they choose to rather invest on the wall and the army… We arrive at our destination by a wide street in the middle of which there is a promenade lined with huge ficus trees: a bit of quietness finally! Tel Aviv is a really noisy place. At the reception desk, a young woman tells there is a problem since today the museum is for the soldiers only. As we say to her that we are taking the plane back home tonight, she finally lets us in. However, we won’t be able to watch the main film, which is shown at regular intervals in the small amphitheatre: militaries first. We are disappointed of course, all the more as the little information Tanguy gave us about it (it is a real propaganda film dedicated to the glory of the Israeli army, ending on an invitation to join in) piqued our curiosity. But we can go around the different rooms just as we please, between the groups of soldiers. Brief surrealistic moment : the young lady asks us to leave our weapons in the hall before we start the visit… Civilian visitors are obviously not commonplace here. The museum itself is set in a new building that rises at the back of Eliahu Golomb’s former house. Golomb was born in White Russia in 1893. He came to Eretz-Israel in 1909. In 1920, he founded the Haganah organisation to replace the Hashomer which he was a member of . In the years prior to statehood, he devoted his life to fostering a Hebrew defence force that was later to become today’s Israeli army. Golomb’s house served in fact as Central headquarters of the Haganah. It was given to the Ministry of Defense after his death in 1945. The visit begins in two rooms that were part of the apartment Golomb lived in and operated from. That’s where decisions were made and from there that the men of the Haganah emerged on their way to carry out their missions: purchase and conceal weapons, disembark illegal Jewish immigrants in Palestine, etc. While we are waiting for our turn to enter the rooms, we have plenty of the time to watch other groups of soldiers standing, sitting or walking around us. They are about our age – 18 to 20- and behave exactly the way we do when we are on a school visit: everything is OK as long as we don’t have class. Except that they are wearing a military uniform and carrying a truncheon. Except that, a few steps away from us, they have piled their machine guns, fitting each one into the other so as to build perfectly triangular towers… They don’t speak to us nor even look at us. They have taken up the whole space: they are at home in this place and make you be well aware of it. Unfortunately, the visit is going to confirm them in their feeling of superiority, Tanguy comments. Alright, the way is free now. We step into the apartment of the founder of the Israeli pre-army. Yet, without a guide or explanations, we don’t notice anything remarquable in it: a table, books, maps… Of course we are no Zionist Jews and consequently can’t feel admiration for this man and his work. We leave the two rooms to climb up the stairs to the museum, following the organised itinerary. First stage: the display opens with the beginning of the Settlement and Defense Movement. In the showcases, there are pictures, written documents and weapons that belonged to the Second Aliya pioneers . Then, the notice boards tells us about the Jewish Brigades during World War I, their volunteering to the British army and their part in liberating Eretz-Israel from the Turkish yoke. We can’t help feeling a bit uncomfortable, surrounded as we are by so many kaki uniforms. Some of the militaries throw quick interrogative glances at our little group, others speak and laugh together while their officers are not looking. Apart from that, the visit is going on normally. Audio-visual shows and wax life-size characters illustrate the display. On the second floor, we find ourselves in the middle of the twenties and thirties, i.e. the years of the organisation and establishment of the Haganah – procurement of arms, preparation of the Jewish population for defense, expansion of the settlements – in other words the years of the progressive colonisation of the Palestinian territory. Then came the time of the clash with the British : following the publication of the « White Paper » (1939) , the struggle against the British power began. It was temporarily dropped during World War II but resumed at the end of it. Diorama, audio-visual shows, a life-size reconstructed post of the Palmach . In the showcases, there are objects illustrating the tricks the Jewish fighters used to transfer and conceal weapons (for example, a book whose pages were cut into the exact form of a revolver and served as an arm cache). The display ends with the 1947 War of Independence and the creation of the Israeli army, the Israeli Defense Force (IDF), or Tsahal, in 1948, which our friends in Al-Arroub have renamed the IOF: the Israeli Occupation Force. As far as form is concerned, we have to admit that the museography lies on an attractive multimedia presentation: videos, sound recordings, clear and didactic notice boards. The visitors follow the peregrinations of a fictitious character, Yitsik, who escaped from a ghetto in Central Europe to join Palestine where he became a war hero. What we will remember is above all the important part the Haganah played in the transportation of the survivors from the nazi judeocide to Palestine. In this context, the episode of the Exodus is essential. We have also learnt that Belgium was a hub for the supply of arms. Tanguy suggests we went down to the Café Tamar where we canld have some bagels. We cross the district of the posh boutiques and get to the said place, which is run by Sarah Stern. The lady is an institution in Tel Aviv: she was already there during the British mandate, serving food and drinks in the Formica decor of her café, in the middle of her collection of the charicatures famous (or unknown) people drew for her. Hearty meal, after which we walk down on the beach in order to enjoy the great weather. The most courageous of us have a swim, the others a lazy siesta on the warm sand. We then go and buy some pidés (kinds of mini-pizzas) for tonight’s dinner, then head to the youth hostels to pack up. Ronnie tells us he lives in Tel-Aviv, is aged 34. He is wearing a three-day old beard and has an open smiling face. He is not that big but looks muscular. He seems to feel good about himself, relax, welcoming. He doesn’t know exactly how to continue yesterday’s conversation, where to begin, or what with. We suggest he started by the beginning: introducing himself and telling us how he came to become an activist, an “Anarchist against the Wall”. What would he, as an Israeli, tell us about the situation ? He tells us then about the so well-oiled brainwashing mechanism that is on in the Israeli society and its education system. It starts from kindergarten, which he went through, like all the Israeli kids: he mentions the repeated lessons about the justified creation of Israel, about the right of the Jewish people to be on this land and to resort to certain means to get back this land, “which has been theirs for more than 2000 years”. But, he adds, his family was OK. He never heard such speeches at home. As we ask him if he knows that one of the psychological explanations given to such “anti” behaviours as his is “self-hatred”, he smiles, shrugsd his shoulders. He has heard more. Anne-Claire, JF and Tanguy tell Ronnie that, thanks to their friend Daoud, they had the opportunity to travel over part of “Palestine of 1948” and that, indeed, they could witness traces of this organised theft of the ressources all along Motorway 90 in the Jordan Valley: on the one side of the road, they could see Palestinian communities living in poverty and destitution while, on the other side of it, the electrical fence protected the settlements, their secured farms and the intensive cultures. We run up back to the Youth hostel. Everybody charges their bag on their back and Yallah! Let’s go! Anne-Claire, Tanguy and JF bring the younger ones to Tel Aviv station (except for Caroline who is staying for a week with her family in the north of Israel and for Natalia who left to Belgium two days ago). From there, the train will take them directly to the airport. A moment of stress for Sébastien (again, just like at Bethlehem checkpoint!) who is bringing back Israeli and Palestinian cola cans for his father, who collects them: the metal detector alarm sounds and one of the security guards orders him to follow her to a table where she asks him to open his bag and questions him about the cans. Sébastien has some trouble convincing the lady. Margot, on the other hand, goes through the security check without anybody asking her anything or searching her bag and without the metal detector being triggered: that’s the difference between having red or black hair, apartheid is everywhere all the time, she says half-jokingly. 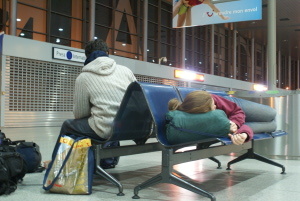 The plane takes off and carried away five young people whom the travel has changed, some of them more than the others. Marie-Gaëlle has decided she will take part in one of the summer camps Daoud organises for the children of East-Jerusalem. Once her studies are over, she will come back to Palestine to shoot documentary films about its inhabitants. It is now obvious for Margot that most of the western media are no reliable source of information. She is aware of how huge a job there is to do to inform the people correctly. She is coming back from Palestine with a strong desire to tell her friends how important it is to open one’s eyes and one’s heart. Next year at university, she wants to study History and to put it at the service of more justice for everybody in the future. Caroline is going to study medicine and in parallel she is determined to testify as much as she can, so the people around her get involved. Sébastien never says much but he seems to have taken the full measure of the unfairness of the fate reserved to the Palestinians. Laurie progressively has dropped the armour of distrust with which she joined the project. The fact she didn’t know English went for a while against her of course: as she always had to resort to translations by Anne-Claire or Tanguy, she couldn’t help feeling that what they were telling her were attempts to brainwash her. Fortunately, it seems that sharing the young people’s everyday life in Al-Arroub has finally helped her open her eyes and understand that the discourse according to which the Palestinians are a danger for the security of Israel is hypocritical and misleading. What she will do with that, nobody knew. Same question for Natalia and Sébastien. This makes us sorry. If even going out there doesn’t make you open your eyes and heart, what can still be done? 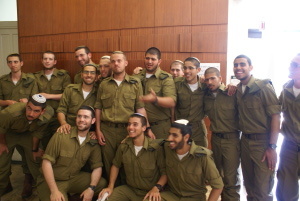 Just to remind you, military service is compulsory for all young Jewish Israelis. Conscientious objectors end in prison. Only women are allowed to do civil service. 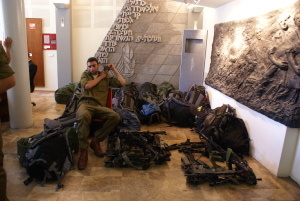 Founded in 1909, Hashomer is an organisation dedicated to the guard and defense of the Jewish settlements in Palestine. It was first present in Galilea then in the West Bank (« Judea and Samaria »). It took part in the creation of new settlements and ended up streching its defense sysstem to all the territory. Aliya is a Hebrew word meaning "ascension" or "spiritual rise". For a Jew, it refers to the act of immigrating to Eretz Israel. The second Aliya started after the 1903 pogroms and lasted until 1914 (First World War). Between 30 000 to 40 000 immigrants, most of them Zionist socialists, came from the Russian Empire. David Ben Gourion is one of them. Tel-Aviv (founded in 1909) dates back from this second Aliyah. The Zionist left-wing political parties who will run the state after it is created in 1948 were created by these immigrants too. With this White Paper, published on May 17, 1939, England tried to ease the uprising of the Arab population of Palestine: the sale of new lands to Jews iq now limited so as not to create an important Arab population without lands. Above all, the Jewish immigration juive is limited to 75 000 people during 5 years so the Jewish population doesn’t exceed one third of the population of the country. In the same document, the creation of a common and independent Palestinian state (with an Arab majority) is considered (quite vaguely) within the following ten years. The application of the White paper by the British mandate will intensify at the end of the Second World War, fighting in particular against the massive flood of the survivors of Nazism and of the judeocide. The White Paper led to a strong reaction on the part of the world Zionist institutions and caused a first wave of anti-Britishattacks committed by Irgoun from 1939 on. From 1944 to 1948, the armed organisations (Lehi, Irgoun and to a lesser degree Haganah) killed more than 300 Britons, as well as dozens of Jews and thousands of Arabs. Bevin, the British Foreign Minister was at a loss and decided in February 1947 to bring the matter to the UNO. The first law the young state of Israel voted concerned the repeal of the « White paper ». Striking companies of the Haganah, paramilitary Zionist Jewish group set up in 1941, active during the Second World War up to the independence the state of Israel. Read the article by +972 on this subject. 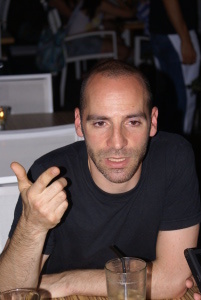 For example Jonathan Pollak, condemned to three months imprisonment for having taken part in a cycling demonstration in Tel Aviv. One example among others : Amir Makhoul, managing director of the Union of Arab Community-based associations in Israel, ITTIJAH (based in Haifa), was recently condemned to 9 years imprisonment, accused of spying on behalf of Hamas. Cf. article by Peace now. For the year 2010 only, for example, between the beginning of July to mid-octobre, the village of Al-Arakib was razed six times to the ground. Souces : AIC, "Bédouins oubliés du Naqab" de Joseph Algazy - le Monde Diplomatique, www.jnf.org. For example, the state lands cannot be (and for that matter never are) sold to non-Jews. Let’s remember that in 1975, the general Assembly of the United Nations adopted Resolution 3379, which considers Zionism tantamount to a form of racism. This decree was crossd out in Decembre 1991. Yet, in 2001, during the conference against racism, Israel was condemned vehemently. Nothing has changed on the ground since then. Ayed Morrar, a citizen of Budrus and a community organizer, unites all Palestinian political factions and Israelis. Together, they wage a peaceful struggle to save his village from destruction by Israels Separation Barrier. Victory seems improbable until his 15-year-old daughter, Iltezam, launches a womens contingent that quickly moves to the front lines. They not only save the village, but the Barrier is pushed back behind the Green Line into No Mans Land. In the process, Ayed and Iltezam unleash an inspiringmovement in the Occupied Palestinian Territories that is still gaining ground today. The movie "Budrus" directed by award-winning filmmaker Julia Bacha, is an action-filled documentary featuring archival footage of this movement from its infancy. It doesn’t only tell about one Palestinian village. It tells a much bigger story about what is possible in the Middle East. Ayed succeeded in doing what many people believe to be impossible: he united all the Palestinian factions, including Fatah and Hamas; he brought women to the heart of the struggle through the leadership of his daughter, Iltezam and he encouraged hundreds of Israelis to cross into Palestinian territory for the first time and join a nonviolent movement.The story of Budrus represents what could happen in the region - provided people know about it. 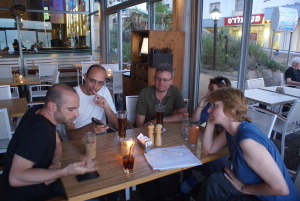 The film got several awards in different festivals (Panorama Audience Award Second Prize, Berlin International Film Festival, 2010 - Special Jury Mention, Tribeca Film Festival, 2010 - Audience Award, San Francisco International Film Festival, 2010 - Honorable Mention for Best Documentary in the Spirit of Freedom Award, Jerusalem International Film Festival 2010 - Witness Award at Silverdocs Film Festival, 2010 - Honorable Mention of the Jury, Documenta Madrid 10 - Amnesty Italia Award, Pesaro Film Festival, 2010 - Founders Prize, Best of Fest, Nonfiction, Traverse City Film Festival, 2010 - Checkpoints Award, Bergen International Film Festival, 2010 - Festival des Libertés Prize, Festival des Libertés, 2010). See also Julia Bacha’s talk for TED Ramallah: http://www.youtube.com/view_play_list?p=5A7AEC1D575EAD3F. See for example the information sites boycottisrael or Popularstruggle. Consult on this subject the excellent little book by Karine Lamarche, "En attendant la chute du mur - Agir et protester en Israël aujourd’hui" (Ginkgo Editeur), On the cover: a picture of... Ronnie ! St Mark, Chapter 4 (extracts): “1 On another occasion he began to teach by the sea. A very large crowd gathered around him so that he got into a boat on the sea and sat down. And the whole crowd was beside the sea on the land ; 2 And he taught them at length in parables, and in the course of his instruction he said to them, 3 ; hear this ! A sower went to sow. 4 And as he sowed, some seed fell on the path, and the birds came and ate it up. 5 Other seed fell on rocky ground where it had little soil. It sprang up at once because the soil was not deep ; 6 And when the sun rose, it was scorched and it withered for lack of roots. 7 Some seed fell among thorns, and the thorns grew up and choked it and it produced no grain. 8 And some seed fell on rich soil and produced fruit. It came up and grew and yielded thirty, sixty, and a hundredfold." 9 He added, "Whoever has ears to hear ought to hear." 10 And when he was alone, those present along with the Twelve questioned him about the parables. 11 He answered them (…) 14 The sower sows the word. 15 These are the ones on the path where the word is sown. As soon as they hear, Satan comes at once and takes away the word sown in them. 16 And these are the ones sown on rocky ground who, when they hear the word, receive it at once with joy. 17 But they have no root; they last only for a time. Then when tribulation or persecution comes because of the word, they quickly fall away. 18 Those sown among thorns are another sort. They are the people who hear the word, 19 but worldly anxiety, the lure of riches, and the craving for other things intrude and choke the word, and it bears no fruit. 20 But those sown on rich soil are the ones who hear the word and accept it and bear fruit thirty and sixty and a hundredfold." 21 He said to them, « is a lamp brought in to be placed under a bushel basket or under a bed, and not to be plced on a lampstand? (…) 23 Anyone who has ears to hear ought to hear.